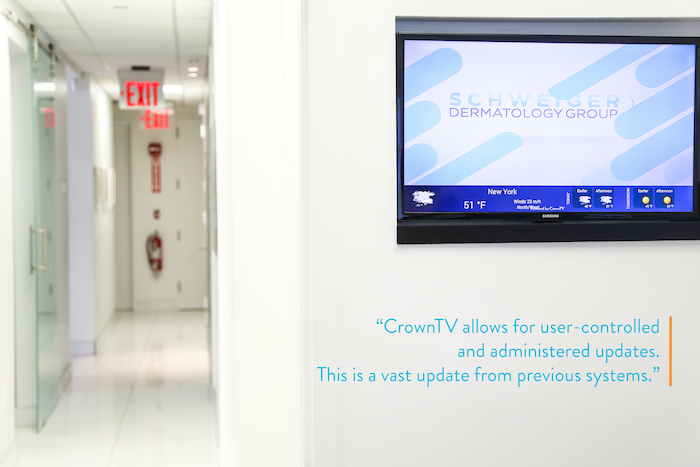 CrownTV began working with Schweiger Dermatology around spring of 2016, eventually deploying digital signage players across its 22 office locations – and growing. 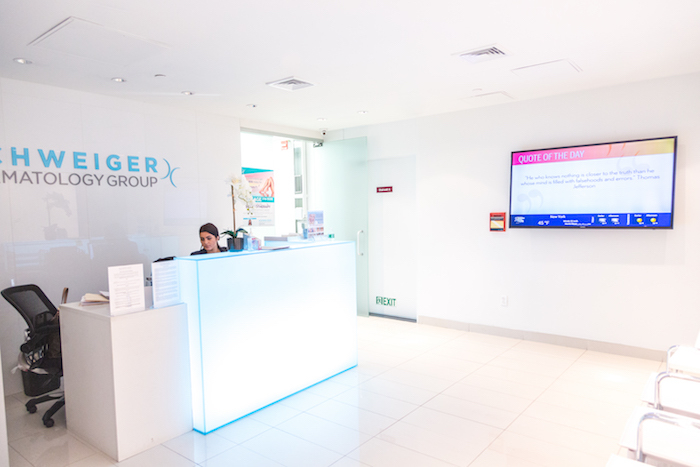 Schweiger had existing digital signage in place but were not satisfied with its functionality, which is where our story begins. 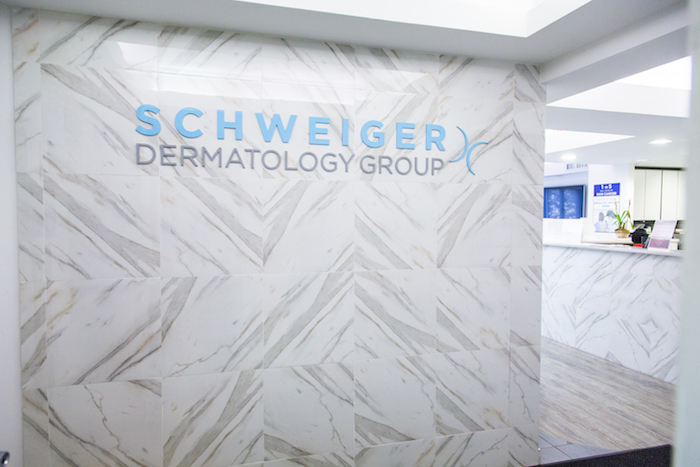 As a savvy and modern dermatology practice, Schweiger had already been using digital screens in their offices when they first connected with CrownTV. However, they weren’t happy with their existing system’s lack of access to a “back end”, or content management system (CMS). They needed their employees to be able to customize and control content as needed, but didn’t have that capability. Any time content needed to be added, edited or removed, there wasn’t a quick and easy way to do so. They also lacked the ability to schedule content ahead of time. All of this led to Schweiger’s offices rotating the same few pieces of content over long periods of time, without much variety. CrownTV stepped in to upgrade Schweiger’s system, working with each office’s existing screens and infrastructure to install our solution. That solution is complete with plug-and-play digital signage players and a cloud-based, online content management system. Installation was a breeze due to the turnkey nature of our solution, and was carried out during business hours without disturbing Schweiger’s patients or regular operations. Schweiger’s new CrownTV dashboard has features like multiple user access, scheduling options and remote content control, which went above and beyond addressing Schweiger’s main content management pain points. “CrownTV allows for user-controlled and administered updates. This is a vast update from previous systems that would not allow for full editorial control in terms of adding new marketing and promotional content,” Schweiger’s marketing department told CrownTV. Now, updating content is as easy as logging into their CrownTV online dashboard and making a few clicks. They also enjoy the ability to schedule any screen’s content from the dashboard, remotely if necessary, down to exact days and times. For instance, when Black Friday came around and Schweiger had special promotions to advertise, this feature came in handy. Having 22 offices across two states, with as many as 15 screens per office, Schweiger also appreciates being able to have multiple user accounts for employees who need access to the dashboard. Each user gets their own login and password. The account administrator can even give users differing levels of permissions; for example, giving a user at the Garden City, Long Island office access to only that location’s screens. With so many offices and screens, it’s also important for Schweiger to be able to monitor their digital signage network and make sure everything is running smoothly. The CrownTV dashboard’s Real-Time Player Status feature addresses this concern, allowing Schweiger to check on the connectivity of their displays and alert CrownTV support as soon as there’s a problem. Schweiger were lacking not just in how they displayed content, but also what content they could display. Before CrownTV came in, Schweiger’s content was limited to mainly slideshows of static graphics. They used these slideshows to inform patients about their doctors, products and services – and still do now. However, as stated in the previous section, updating this content wasn’t easy, so it often remained the same for a while. Displaying seasonal content, like limited-time promotions, was also difficult due to the lack of an accessible CMS. There was no video content, and displaying interactive apps like social media was out of the question. What Schweiger were missing was engaging, interactive, dynamic content beyond image slideshows. They also lacked customizability. There was no simple way to alter their existing content if they wished, or swiftly create new content to display. Schweiger users have access to customizable templates, created by CrownTV designers according to the practice’s branding guidelines. Simply fill in the proper text and photos and a branded graphic is ready to display, like the one below. Schweiger loves using these templates to display background information on their providers, statistics about the practice, information on products and procedures, seasonal promotions and more. In fact, it’s their favorite CrownTV feature. Another favorite feature of Schweiger’s is displaying a live Instagram feed. In the world of dermatology, the “before and after” photo is a valuable currency that brings major credibility to a practice. It proves to audiences that Schweiger brings real results to real people. Schweiger patients’ before and after photos often show up on Instagram, being shared either by the patients themselves or on Schweiger’s official page. CrownTV’s digital signage solution allows Schweiger to tap into this valuable source of credibility by displaying these Instagram photos on their office screens. 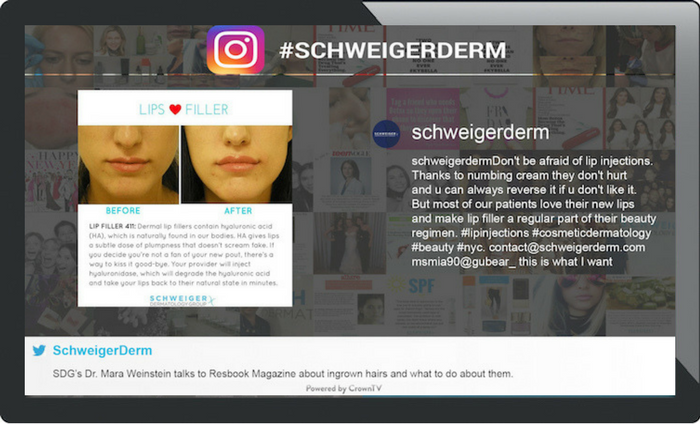 They can display their own page’s feed or any patient photos that use their branded hashtag, #schweigerderm. It boosts the practice’s visibility and trustworthiness both online and in their offices. A visit to any medical office usually involves some form of waiting. Waiting in a Schweiger office, however, is much more pleasant due to their digital signage, particularly with content like CrownTV’s Quiz and Quote of the Day apps. Schweiger displays these apps in their lobbies and within the examining rooms. No more being stuck with only magazines and medical brochures while you wait. Schweiger also enjoys the ability to display their informative Twitter feed or the local weather. What’s more, they can display them alongside other content in the form of widgets. 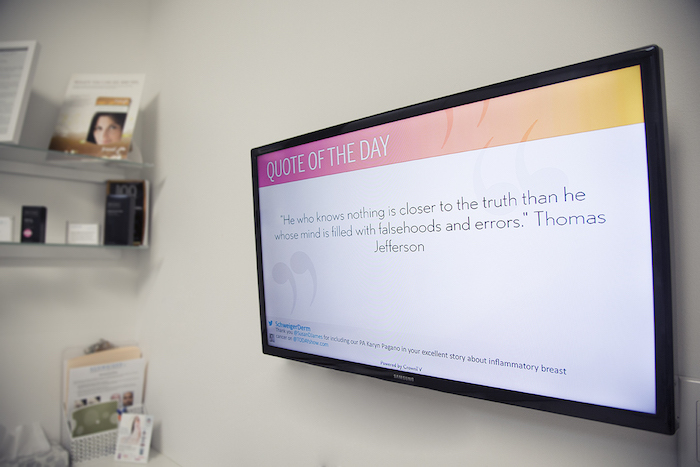 This allows them to get the most out of their screen space, informing and entertaining patients at the same time. Schweiger loves the amount of control and customizability they now have over their digital signage content, allowing them to expand what kind of content they display. 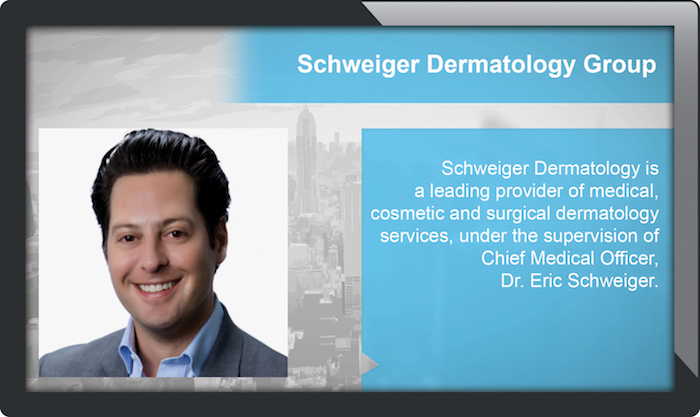 “With CrownTV, we are now able to display informative content via videos and slideshows about what Schweiger Dermatology has to offer, ranging from products sold to cosmetic and medical treatments and procedures available,” the marketing department emphasized. Although having a dashboard to manage content seems like it should be a given, for Schweiger it previously was not. They’re grateful to now have this essential function. “Providers have given feedback over the past few months requesting for updates, and after those were implemented, they were pleased with the results,” marketing told us. 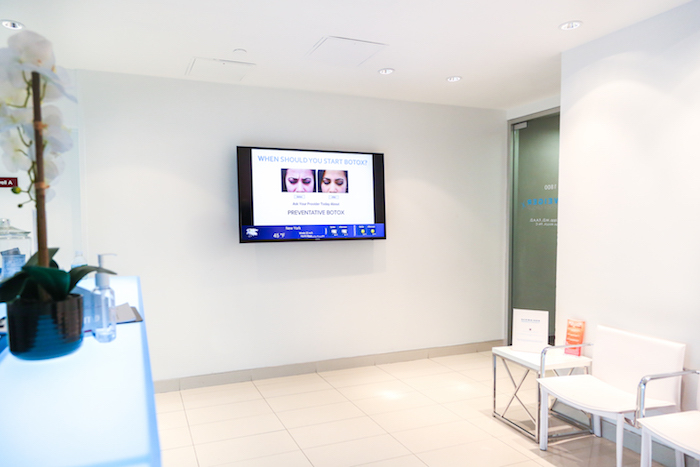 Schweiger Dermatology Group looks forward to continuing their use of digital signage to inform patients on achieving their best skin ever. The results speak for themselves, but digital signage puts them on full display. Have an office that’s in need of a facelift? Request a demo of our digital signage solution and we’ll discuss how CrownTV can completely transform the look and feel of your business. Get our hot blog posts and insanely useful resources delivered straight to your inbox. No sales pitches, no games, one-click unsubscribe.